Over the past 10 years, the cost of technology for variable renewable energy (VRE) such as wind and solar energy, has declined considerably, providing a cost-effective and sustainable means of meeting electricity demand in developing and middle-income countries. As of 2014, 144 countries have established national plans to expand renewable energy, and almost 100 have enacted policy reforms or introduced incentives to promote the use of renewables. 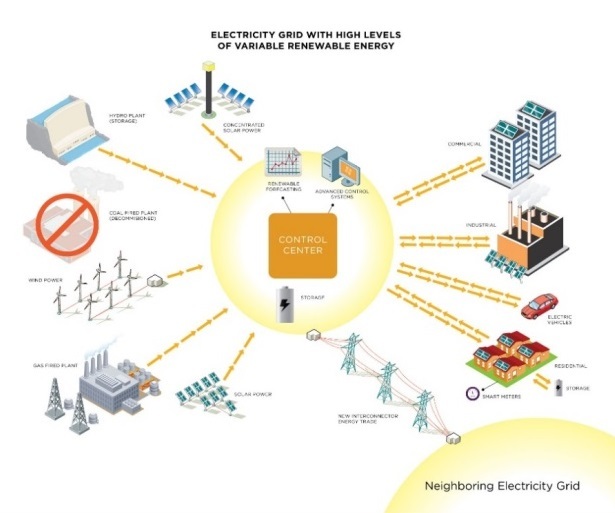 Though taking advantage of variable sources of energy requires significant expansion and modernization of electrical grids, research shows that comprehensive planning strategies that gradually transform power systems into “VRE-friendly” grids can significantly reduce long-term integration costs. A recent ESMAP report, Bringing Variable Renewable Energy Up to Scale: Options for Grid Integration Using Natural Gas and Storage, looks at approaches countries can take to integrate large shares of VRE into their grids without compromising the adequacy, reliability, or affordability of electricity. The need for technical assistance on VRE integration is greatest in countries with limited capacity to tackle technical and regulatory challenges. To meet this growing demand, ESMAP is scaling up its support for VRE integration activities. ESMAP’s VRE Grid Integration Support Program aims to increase the capacity of countries to develop policies and improve investment planning as well as encourage the adoption of best practices for VRE integration. The program offers technical assistance for system operation and long-term grid planning, in the strengthening of electricity dispatch, generation and transport infrastructure as well as for the development of economic, legal and regulatory framework conditions tailored to VRE integration. ESMAP has partnered with the Clean Energy Ministerial and NREL as part of the 21st Century Power Partnership (21CPP) and receives in-kind support from the Global Sustainable Electricity Partnership (GSEP). In addition, the program has supported World Bank teams in a number of countries to obtain funding from the Korea Green Growth Trust Fund (KGGF) and, in the case of Small Island Development States, from the SIDS DOCK Support Program. Justâin time advisory services by a network of international experts to solve immediate concerns on VRE system integration. Operational support with a focus on management tools for power systems with large shares of VRE. This includes, among other things, the design of advanced forecasting systems and control technologies, the upgrading of dispatching centers and the elaboration of adjusted operating procedures to optimize the use of existing flexible generation and storage. Grid integration studies and planning strategies to support a realistic and affordable plan for scaling up VRE with a focus on the whole system, maintaining system security and reliability. Support for new regulatory frameworks, in particular grid codes, VRE procurement strategies and market designs that explicitly value flexibility and capacity. To learn more about this program, download the Fact Sheet or refer to the links provided below. Training: Current and Future Energy Storage Technologies (Washington, DC, USA, October 2016). Training plus Q&A on trends in technology and cost development for storage and the impact on cost-effective deployment in the US electric grid. The training will be followed by a discussion on implications of storage technology progress for Bank activities. Organized with NREL. Training: Wind Vision and Technology Trends (Washington, DC, USA, September 2016). Training plus Q&A based on the recent US DOE Wind Vision study, which highlights the impacts of trends towards resource-tailored technologies and implications for future development. The training will be followed by a discussion on implications of wind technology progress for Bank activities. Organized with NREL. Training: Solar Technology Trends with US Standard Scenarios (Washington, DC, USA, July 2016). Training plus Q&A to review of the current rapid changes and anticipated changes in solar PV and CSP; the NREL Annual technology Baseline and the solar results within the NREL Standard Scenarios Report. The training will be followed by a discussion on implications of solar technology progress for Bank activities. Organized with NREL. Training: Distributed Generation Course (Washington, DC, USA, June 2016). Training on the latest issues and technology changes regarding the distribution grid, from policy trends to technical issues, including distribution grid electrical issues common in developing countries, future trends in solar PV for distributed systems and future trends in demand response and smart-grid for developing countries. Organized with NREL.